We all love Chinese takeaway, who doesn’t? The thing is I can never overcome the feeling of guilt after ordering tons of food from the Chinese food and eating it like a cave man. It is good but it also is…greasy, far from healthy and well, don’t know about you, but I am not always sure if I can trust the take away place I am ordering from. 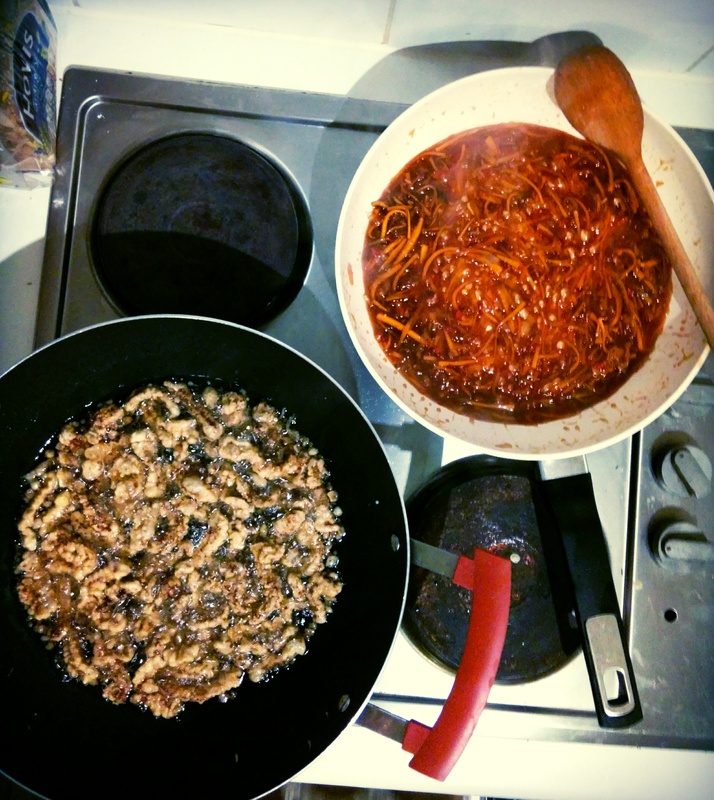 That’s why I decided to make my absolute favourite: crispy shredded beef. And you know what? Turned out to be better than the one we usually order! and surprisingly easy to make. 1. Cut all the vegetables so they’re ready when you need to make the sauce. Cut the carrots and onions into short, thin strips. Finely chop the chillies and garlic. 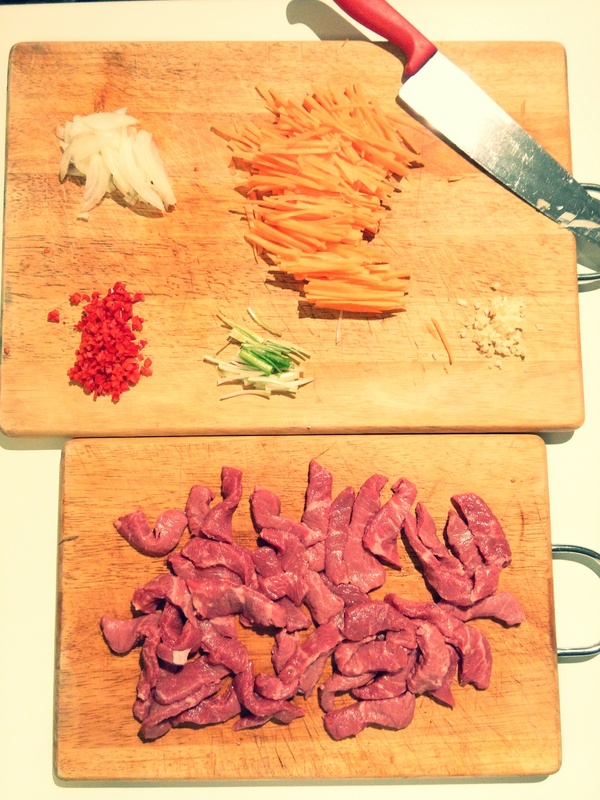 2.Cut the beef into small, thin strips. Beat eggs together with salt and cornflour. Add the beef into to mixture and make sure it’s fully coated. 3. Heat the oil in a deep frying pan (best to use vegetable or rapeseed oil). When the oil is hot, deep fry the beef, adding the beef strips one by one to the frying pan. Cook for 5-6 minutes until crispy and golden brown. Fry them in small batches of about 10-15 strips so they don’t stick together or get soggy. 4. Once fried, take it out of the pan and place on the kitchen towel to soak up the oil. 5. Prepare the sauce. Add the carrots, spring onions, garlic and chilli to the frying pan with a little bit of oil and stir fry them until they become glossy. Then add the sugar, vinegar, sweet chilli sauce and soy sauce and mix well together. 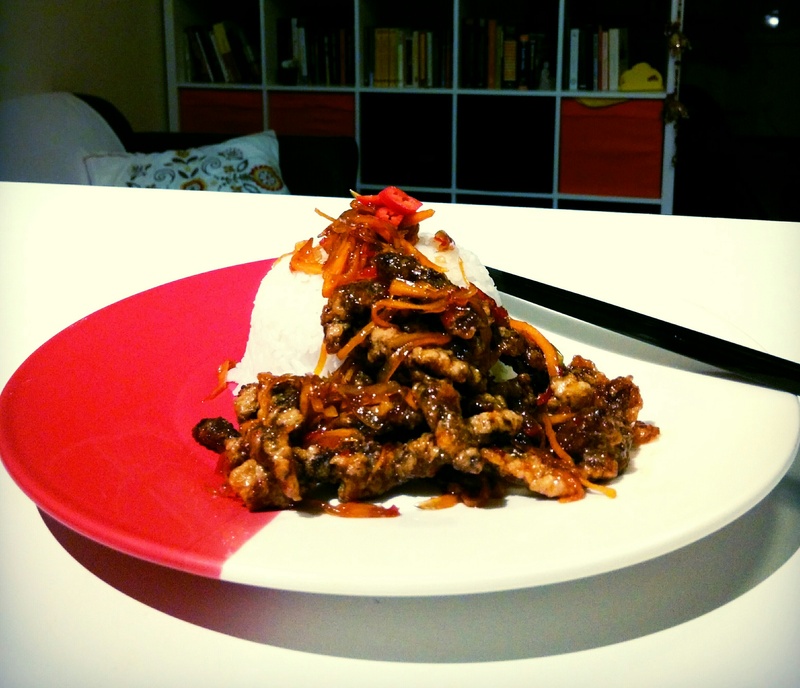 Cook it for a minute, you can add more soy sauce or sweet chilli sauce to your taste. 6. 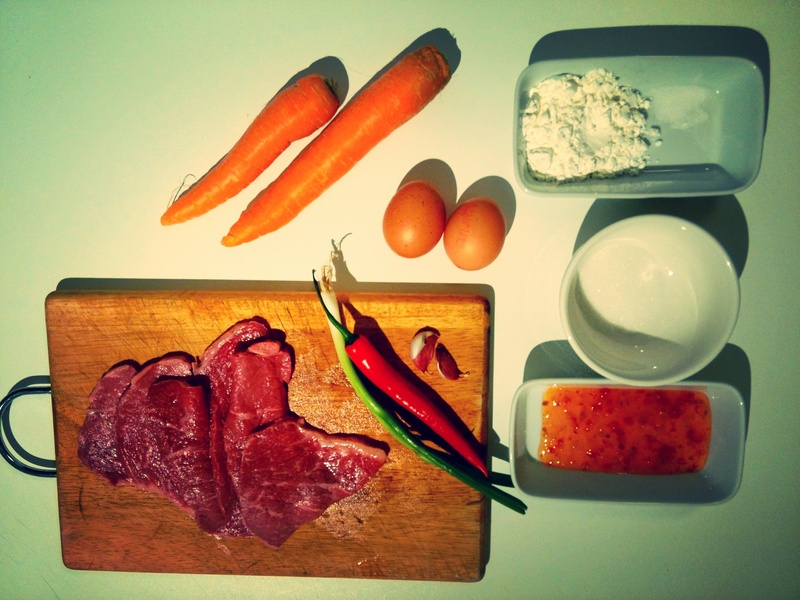 Stir in the fried beef and cook it together for about 30 seconds. 7. Serve with rice (sticky one) or noodles.